Happy Tuesday! I am in a good mood as I write this…. Monday was a busy day with the kids going into school 4 hours late, and then following school I had parent-teacher conferences followed by a PTA meeting. I know, you are thinking, “That sound fun at all! Why on earth is she in a good mood?” I am happy because the conferences went very well. I was honestly worried about how it would go with Sawyer’s teacher, but after meeting with her relief washed over me! Phew! Today, they get out a few hours early, and then we have the next few days off for Thanksgiving. YAY! Anyhow, today I wanted to share a quick and easy little project with you. 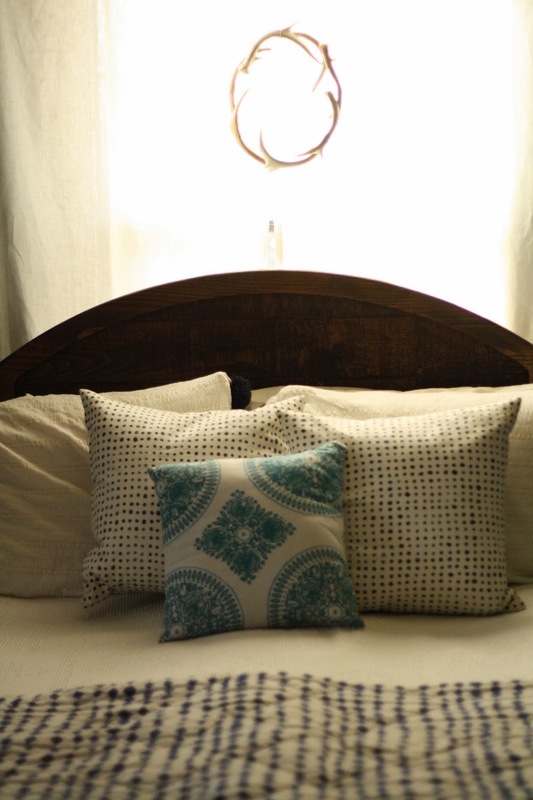 In our master bedroom, our bed sits in front of a window as you may recall…. I would love to have some large statement piece of art over the bed, but with the window there, it just won’t work. I came across this idea and knew I had to reproduce it and that it would work with the window. 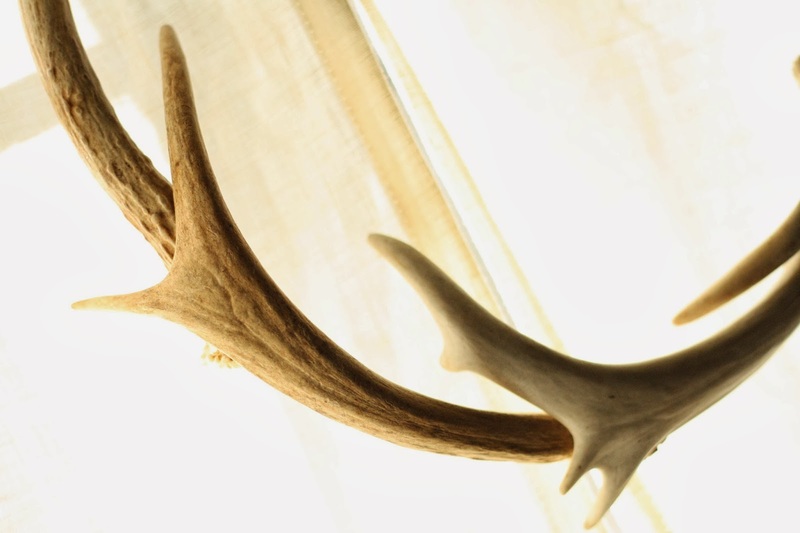 One Saturday I ended up coming across a bunch of antlers at the flea market. To create my wreath, I simply arranged them on a table how I wanted them, and then used my glue gun to connect them. I tied some twine to it so I could hang it from my curtain rod, and here is what I ended up with…. What a great DIY! It works perfectly in the window! I have seen this and loved it. Yes, hopefully won’t come down while you are sleeping and you all of a sudden have antlers at breakfast one day. My kiddos are out all week. Great idea. It looks perfect in your window! I love it Cassie! So beautiful! Very cool – and I’m with you, sure hope that doesn’t fall on you in the night! That is a fantastic idea and I love it above your bed! Have a great Thanksgiving. Boy do we think alike. I was wanting to do the same thing. Now I’m inspired to do it. I am so glad it went well with Sawyer’s teacher! I was so relieved after Brendan’s as well… I felt like I was getting called to see the principal! LOVE this idea!! Perfect in front of the window. Love it! How do you find so many antlers? I am never that lucky. It is perfect for your window! Enjoy your day today with the kids home! It’s just the right touch for over your bed! What a great idea! I actually do Love this! Wish I came across some antlers!! One girl from yesterday’s post had some antler candlesticks!! LOVE THAT TOO! a winner indeed – I LOVE IT. i have amassed quite a collection of antlers and your little project is prompting me to get out the glue gun! 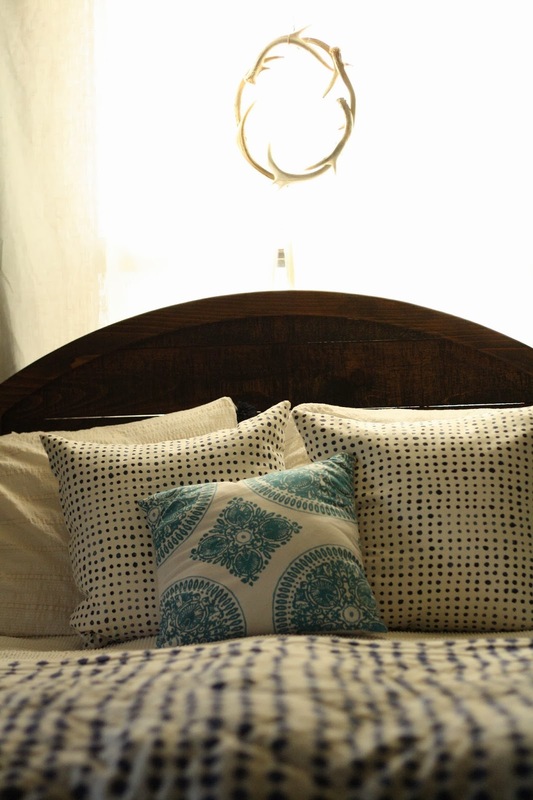 Oh and where did you get your quilt & euro shams – LOVE them! I want antlers too. I have yet to find any. They look cool above your bed. simple and beautiful and so you! Love this! 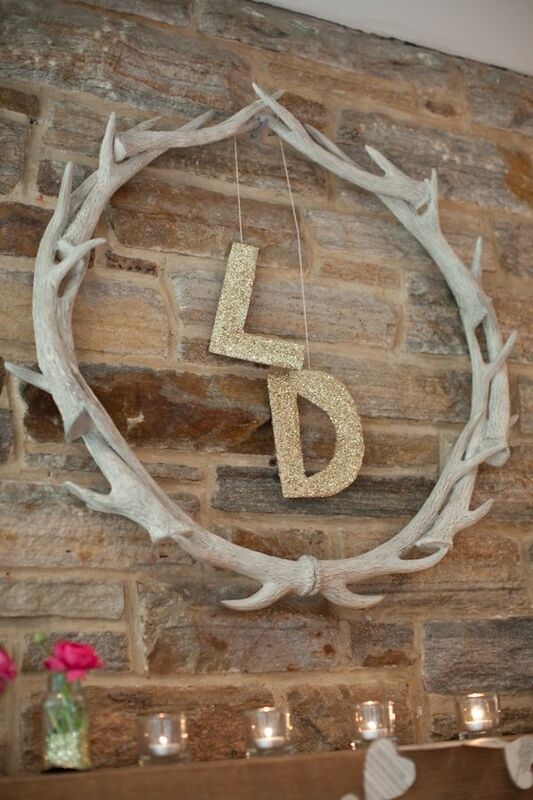 I mean antlers + wreath. Best combo. Perfect for your rustic home in the country! And hopefully you won’t get your eye poked out in the middle of the night because that would be bad! Love it!!! Such a cool and easy project to do. Now I’m on the hunt for antlers 🙂 I hope you all have a wonderful Thanksgiving, Cassie! Cute. what a great idea. I always forget to think of the window just like another wall. wish you a lovely evening Cassie! very cute idea. I like it in front of the window. It makes a nice artwork over the bed! LOL at keeping your eyeballs. That’s a good thing. I lov this look and it’s perfect over the window. The light that’s let in is quite pretty. Woah! 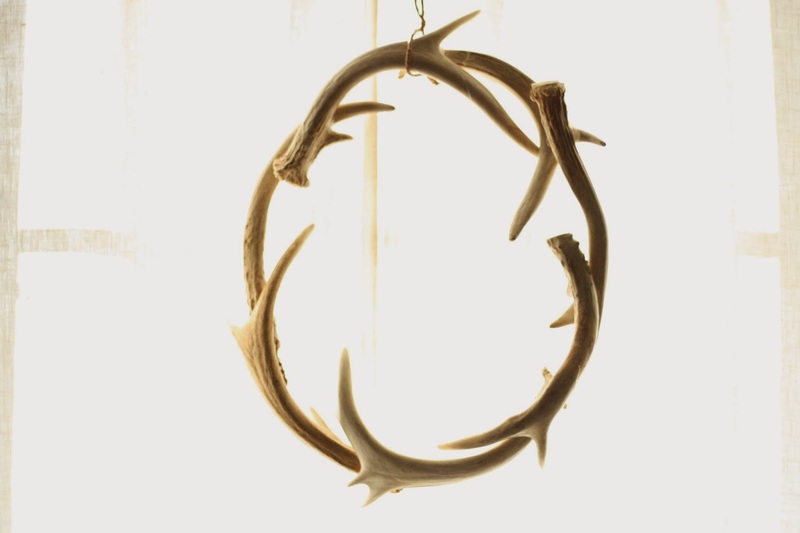 I need this antler wreath!! Love the wreath! 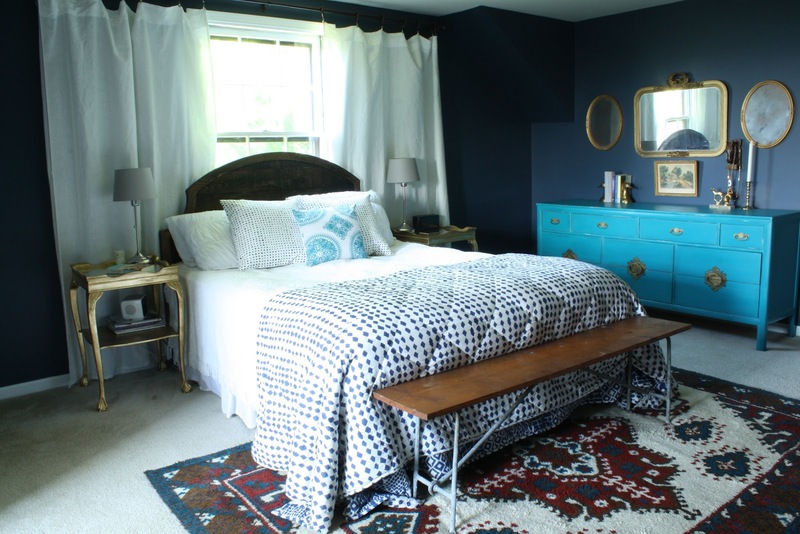 I have been wanting to put my bed in front of a window too, but I’m not sure if my headboard is sturdy enough to stand on it’s own, is yours attached to the wall under the window or the bed frame? And is your bed ever cold in front of the window? These are just the things that have kept me from switching everything around….thanks!